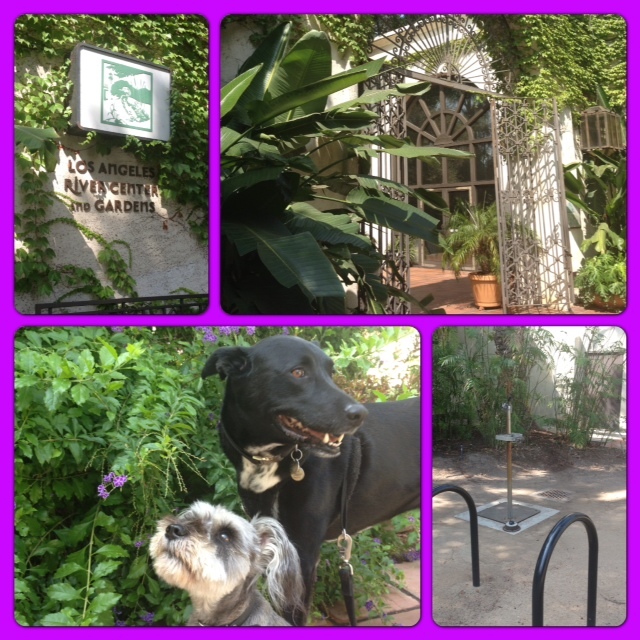 Last week while taking the long way (aka I got lost) to the Hermon dog park I passed by the LA River Center and Gardens. Since I was once an avid customer of the LA River bike path I had read about the center a number of times but never really knew where it was. I was excited to return and check it out. Monday Riggins, Dragon, and I set off on our adventure. The park is located near the corner of Ave. 26 and San Fernando. Unlike other locations in Los Angeles, it has a huge parking lot. I assume this is to accommodate special events when they are happening but on a typical Monday it was a breeze finding a shady spot. I was a little nervous walking in with two dogs. I had my “the web site said dogs were allowed so f* off” speech all ready. I never had to use it. The only people we saw were those who were either working on the gardens or in the few nonprofit organizations that reside within the garden buildings (Friends of the Los Angeles River, Northeast Trees, Los Angeles Conservation Corps, and the National Parks Service Rivers, Trails and Conservation Assistance Program. And yes, I did immediately return home and check their web sites for open positions I could apply for.). The folks there didn’t seem super happy to have a crazy woman and her two dogs invade their little oasis but they left us alone. Inside the buildings courtyard is pretty darn amazing. Oddly enough it reminded me of the Leela Palace in Bangalore that I had visited while I was there. Except it wasn’t as grand, you couldn’t get an amazingly americanized brunch, and Bangalore wasn’t just outside the gates. It did share the fact that it is a lovely oasis in the middle of a city (and, if we were being honest, not the best area within the city) with beautiful plants and architecture that gave you a place to get away and just wander around. The dogs and I did a couple of loops checking out all the nooks and crannies and looking for the perfect photo backgrounds. 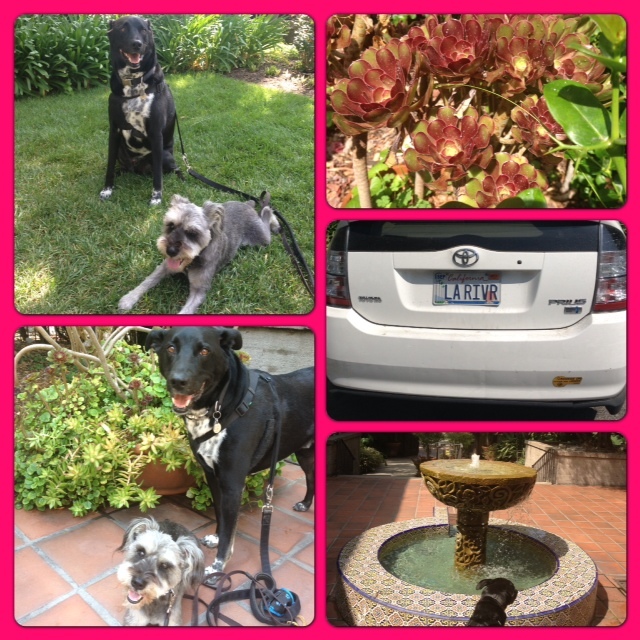 Much to Dragon and Riggins dismay there were almost limitless pretty picture options! Just outside the courtyard you will find the bicycle staging area. It has a drinking fountain, tire pump, and other facilities cyclists may need. I had expected the center to back up right to the bike path but it doesn’t. There is train tracks and the actual river between the end of the bike path and the center. To get there on bike you would have to take some LA streets. Not my favorite on my bike, but good to know it is there if I ever need it. Just past the courtyard is the actual River Garden Park. It’s kinda crappy. I’m sure it’s amazing when it is clear of weirdos hanging out and the water element is on but that isn’t what we experienced. It’s tiny and separated from the center so not really a positive or negative addition. I have to say the courtyard would be an AMAZING location for a special event. I’ve spent the last hour looking at photos of folks who have had their wedding there. There is even a beautiful outdoor fireplace and a built-in bar. It’s designed for a party. Based on the reviews I read it is crazy expensive. Still, it would make a wonderful location for my 40th birthday party. I just need to win the lotto and make a crapload of more friends before next March! We hadn’t done nearly enough walking to poop out the dogs so on our way home we stopped by another park, Rio De Los Angeles State Park. What a friggin’ gem that is! It is huge, very clean, and pretty. 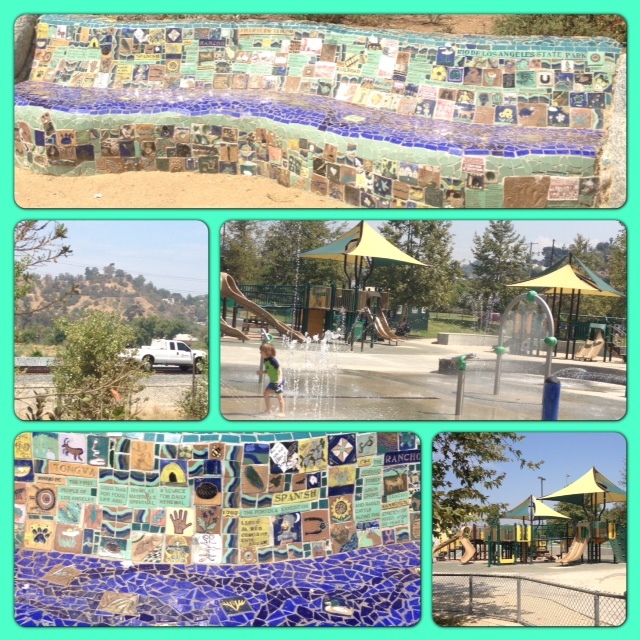 They have some spectacular playground equipment complete with a water park! It also has tennis courts, basketball courts, baseball fields, softball fields, soccer fields, and a walking trail. The dogs and I took the walking trail. It’s an easy loop that takes you down close to the railroad tracks (and therefore the river). It has been restored to look like the wetlands the area once was, which makes it another time-out from the city just beyond the gates. When we were there the majority of folks at the park were on the soccer field. There were only 2 kids on the play equipment and only 1 very smart child having fun in the water. I got close to take pictures and couldn’t help but laugh at his happy giggles. He was having way too much fun. I wanted to leave the dogs with his nanny (I’m assuming) and go have fun with him! I honestly don’t know why everyone with kids isn’t there everyday! My mom suggested perhaps it wasn’t a safe neighborhood. Ok. I’ll give you that. Outside the gates is a bit of a crapshoot. That area is mostly industrial. The FedEx joint is next door and the Kia dealership is a bit further down the road. When I had a crappy Kia that’s where I’d go for service and then walk across the street to this dive burger joint for THE BEST breakfast sandwich of all time. I was the only woman customer there and the only person that would mark “white” when asked ethnicity on a form but I never felt unsafe. It is technically on the edge of Glassell Park which isn’t known for its safe and gun free neighborhoods but come on … what neighborhood is really safe? The park is clean, well-kept up, and oodles of fun. Just hit the ground if you hear gunshots. Your parting sentence made me laugh out loud!!!! !